While I was on vacation at the end of February Emeco released their results for the first half of fiscal 2014, and they also announced that they are planning to refinance their debt by offering US$360 million in senior secured notes and by establishing an A$75 million revolving credit facility. A successful debt refinancing will mean that the company doesn’t have to worry anymore about meeting their current debt covenants, but I do think that the fact that they are looking to refinance is slightly negative. Their current average debt maturity was more than 4 years; you only refinance that because you are forced to. At the same time it’s of course good that they are able to refinance. With the company trading at two-thirds of adjusted NCAV (see my original write-up for details) this discount still implies significant upside in a liquidation scenario. If we discount all their equipment by 20% the implied value is A$0.43/share, almost twice the current market price. And fully liquidating the company is not really what we want to see. We just want them to sell the idle equipment to manage their debt level: the equipment that is in use is generating plenty of cash flows. In the second half of FY 2014 they have increased the amount of asset disposals significantly with US$35.1M in sales in just two months time, but based on the information provided in the conference call this was also done at a slightly higher discount. Most of the disposals were however done in the Indonesian business segment where the company has a zero utilization rate, and while mining equipment can be used world wide, shipping it isn’t free. I think their equipment in other parts of the world is probably slightly more valuable. In the conference call the CEO also indicates that they have a number of sizable deals lined up, and that they think they could generate between A$90 million and A$100 million in cash from asset disposals in the second half of FY 2014 if they have to. 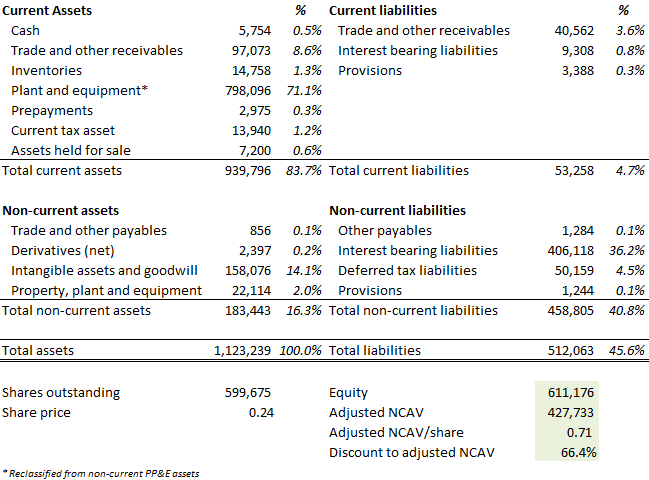 So while the company continues to struggle (expected EBITDA for FY 2014 was revised downwards from A$90~105 million to A$82~94 million) I think the thesis is still intact: the value of their equipment is sufficiently high to manage their debt load and wait for better times. This entry was posted in Portfolio and tagged EHL.AX on March 6, 2014 by Alpha Vulture. Emeco was caught dramatically by the contraction in mining and civil construction. Demand fell steeply in second-half 2009 causing a drop in utilisation rates. Still, it survived. It is among the most volatile of companies with cyclical demand, high operating leverage and heavy capital expenditure requirements. When you look through the Morningstar lens it’s hard to see something to like, but I would argue that they are viewing the company from the wrong angle. Demand is certainly cyclical, but is the operating leverage really high? Are capex requirements a problem? Thanks to red. who has been blogging about Emeco since the end of 2012 I view things slightly different. Emeco is a rental company: they don’t own a large production facility with high fixed costs. The PP&E on their balance sheet is mostly dump trucks, excavators and other heavy equipment. When there are no customers it’s just sitting idle without draining cash, and without losing value: a truck that isn’t used isn’t subject to wear and tear. This is also recognized by the company in the accounting since depreciation is calculated and charged based on machine hours worked over their estimated useful life. When you check the income statement you’ll see that the biggest costs are in fact variable costs: repairs and maintenance, and depreciation expense are the biggest expenses, and both are variable because it’s based on the utilisation rate of their rental fleet. What I think is a second misunderstanding of the business are so called heavy capital expenditure requirements, because it’s actually an opportunity to adjust the balance sheet to demand. Last year the company recorded a depreciation expense of A$107 million for plant and equipment while it started the year with A$1,305,962 in gross P&E and A$793,128 in net P&E. That’s a lot of depreciation in a year where the average fleet utilisation was just 67%. If we do the math this implies that the average expected useful life of the equipment is a bit more than 8 years when fully utilized. What this means is that Emeco can relative easily shrink their rental fleet when demand is low. Simply stop reinvesting in new units, and normal wear and tear will reduce the fleet. A second important implication of the relative short life of the heavy equipment (presumably when it’s used 24/7) is that idle equipment should retain it’s value even when worldwide mining activity would decline, because worldwide supply can shrink at the same time as demand. This is unlike shipping or oil drilling were ships/rigs can have 50 years of useful life. A long useful life means that supply is basically fixed, and that day rates can vary wildly without any apparent relation to replacement cost. The more often something needs to be replaced, the more relevant replacement value is. Based on the consistent history of selling equipment above book value I think that Emeco should roughly be worth tangible book value. This would imply a share price 3x above current levels. A concern is the high amount of debt that Emeco is carrying, but given the big discount there is still a reasonable margin of safety. The equipment could be marked down by 33% and Adjusted NCAV would still equal today’s market cap. Looking at the amount of new mining equipment that Caterpillar is selling should also tell us something about the state of the second hand equipment market, and the market value of the equipment. In the first nine months of 2013 Caterpillar saw revenues in the resource industries segment drop with 33%, but that still means they were able to sell more than $10 billion in new equipment. If there is still demand for new equipment you have to figure that there is also demand for used equipment, and it’s easier to offer used equipment at a discount than to lower the prices of new equipment. It’s not enough that the debt is backed by substantial tangible assets. The debt maturity profile, and the ability to meet debt covenants are quite important too. While I do think that their unused equipment can be converted to cash relative easily there are limits to their balance sheet flexibility. Selling ~A$50 million worth of equipment in a year is presumably easier than selling >A$100 million, and there certainly most be some correlation between their utilisation levels and the market for used heavy equipment. If they would sell their idle equipment today at book value they could generate enough cash to extinguish all debt, but it’s very unlikely that that would be possible. With an expected EBITDA level between A$90 and A$115 million for FY14 the debt needs to be reduced to A$315 million in the worst case scenario. The interest cover covenant wouldn’t be a problem either at this debt level. At the end of FY13 Emeco had A$415 million in debt, and this has been reduced to A$377 million today (in 4½ months time). At this repayment rate they would almost exactly end up at A$315 million in debt, so that’s encouraging to see. Since debt needs to be reduced by A$100 million in FY14 in the worst case scenario they need to raise an additional A$62 million selling idle equipment. They have already sold A$24 million in the first 4½ months, so this seems a very doable amount. And with approximately A$400 million of idle equipment on the balance sheet there must the potential to quickly raise some money if they are willing to offer a discount. I can imagine that they could delay some capex as well, and perhaps liquidate some working capital. Emeco isn’t in the best position, but they should be able to handle their debt load. I like buying companies were insiders own a significant amount of equity, but that’s unfortunately not the case at Emeco. The company does appear to have a good incentive plan though, and bonuses are mainly based on net profit after tax and return on capital. Emeco also has a good history of paying significant dividends to shareholders, and buying back shares. In the past 5 years they returned a total of A$171 million to shareholders. Looking at the past might not be the most useful exercise since the CEO is brand new. What’s perhaps a negative – and certainly in hindsight seems to have been ill-timed – is the large amount of money the company has been spending on (growth) capex in the past few years. Net capex (after asset disposals) in 2013 was A$129 million and 2012 was a record year with A$282 million in net capex. Paying down some debt would have been preferable. The relative low insider ownership creates the risk that management doesn’t have the right incentive when the situation deteriorates further. They could for example be inclined to dilute shareholders by raising additional equity if they think that will save their job. The flip side of that coin is that a high debt level also forces management to do the right thing. Repaying debt is the #1 priority: there is no room to allocate capital to something stupid. Rating: on a scale from one to five I’m going to give this idea two stars. Their debt is a problem – that can probably be solved – but it reduces flexibility, and it might cause a lot of trouble in some scenario’s. Emeco is a bit risky, but potentially also high reward. This entry was posted in Portfolio and tagged EHL.AX on November 20, 2013 by Alpha Vulture.